The probate of a will historically has been a deep hole that families found themselves in when a family member died. If you only have a will, it must be probated. Probate is the process where the court determines who has the rights to a deceased person’s property. Traditionally it has been an expensive legal process. Many attorneys make the argument that the probate of a will isn’t the money sucking, time wasting monster it was 30 years ago. They will tell you that the Uniform Probate Code has “streamlined” probate proceedings. Most states have some version of the Code in place. What does that mean to you? It means nothing. Unfortunately, some attorneys still grind their clock and make probate the cash cow it has always been for them. Maybe they could make it easier, but they don’t. They would lose money and there’s no law that says they have to. Probate can always be avoided. You just need a trust. A trust holds your property and continues to exist after you die so your heirs don’t have to go to court to determine their rights to your property. There are several “levels” of probate. The formal probate runs the full 9 yards. It requires all of the publication in newspapers, the long waiting periods, the multiple court appearances, etc., etc. Informal probates are easier, cheaper and faster (in theory). If we know Dad doesn’t owe anybody money, there won’t be any family fights, we are sure Dad only had one will, and everything else is ok, then do the informal probate. Each state also has a probate process where everything can be done by affidavits, provided the estate value is under a certain limit. The limits vary from state to state. The limit is usually somewhere between $50,000 and $100,000 in gross probatable estate value. 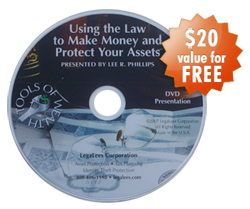 In probate like everything else, you have to know how to use the law and not be used by it. Unfortunately, you can’t always afford to just trust your favorite attorney, even if he was dad’s best friend. The temptation for any attorney to pick the probate plum is just too strong, and the family usually doesn’t know the difference. So, the attorney picks the easy money making plum at the family’s expense. Having said that, I also have to say that there are a number of reasons why you would want to go through the probate process. It is a legal tool. Grandpa was killed in an auto accident. Two kids were drag racing on a street during the lunch hour. There were other passengers in Grandpa’s car, and there were other cars involved. To make sure nobody tried a lawsuit against us, I hurried and probated his estate. Yes, he had a living revocable trust, and I had seen to it that he knew how to use the trust, so there didn’t need to be any probate, but we did a probate anyway. The probate took a good number of months, but it stopped potential lawsuits that could be filed for many years afterwards. It was a “formal probate,” which means we had to publish for creditors (lawsuiters) and jump all of the hoops. But after it was done, I was sure nobody was going to come after us. We were using probate as a tool to protect us. I have given you an overview of the problems with probate of a will and a few solutions in this article. 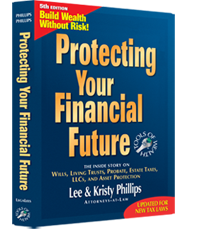 A full discussion on probate can be found in my book, Protecting Your Financial Future.